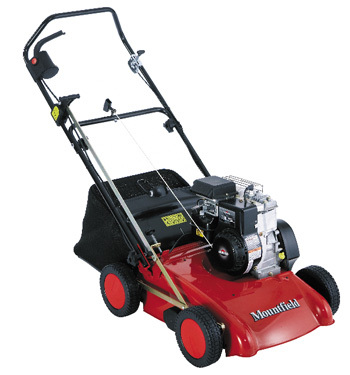 Mountfield is well known for the quality and reliability of its lawnmowers, garden tractors and garden equipment. Mountfield has been one of the leading brands of garden machinery since the early 1960s. Powered by an easy to start Briggs and Stratton engine, the Mountfield S38 Scarifier has a 38cm/15.2" working width and is fitted with sixteen double tipped carbon steel blades. Scarifing depth is fully adjustable to a maximum 2cm to remove thatch and aerate roots gently but effectively. Debris can be collected in the 45 litre capacity collection bag. The machine can also be safely used without the bag as a deflector covers the discharge chute. The Mountfield S38 Scarifier is a powerful, robust tool designed to take the hard work out of lawn care. We supply Mountfield products to our customers in Norfolk and the WaveneyValley area of Suffolk, fully assembled, ready for use and personally delivered by one of our garden machinery specialists who will install the machine and take time to explain its operation. We provide full warranty, service and spare parts support for Mountfield equipment.